Blinn shader is the default shader. It renders simple circular highlights and smoothes adjacent faces. The Blinn shader includes color swatches for setting Ambient, Diffuse, Specular, and Self-Illumination colors. 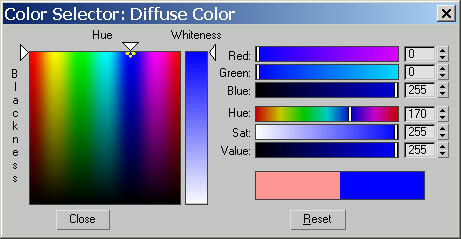 To change the color, click on the color swatch and select a new color in the Color Selector dialog box. The most prominently displayed and intuitive color model is the HBW model. This model represents a natural, pigment-based way of mixing color by starting with a pure color (hue) and then making it darker by adding black, or lighter by adding white. The RGB model adjusts the mix of Red, Green, and Blue to define a color. This model represents the way colored light can be mixed. This is additive color mixing, as opposed to subtractive color mixing for paint and other pigments. You can adjust values by using the color sliders, the numeric fields to their right through the keyboard, or the spinners to the right of the numeric fields. The HSV color model adjusts Hue, Saturation, and Value. Hue sets the color; Saturation (labeled "Sat") sets the color's purity; and Value sets the color's brightness or intensity. You can adjust values using the color sliders, the numeric fields to their right via the keyboard, or the spinners to the right of the numeric fields. The color is selected for the material. After the color is selected, the material is required to be applied on the object in our 3d scene. When you need to apply this material to a sphere shape in the viewport, you can do so by clicking and dragging the material with the left mouse button and leaving it on the sphere object. This makes a material appear lit from within. Self-illumination is not available for the Strauss shader. This controls how opaque or transparent a material is. This controls the brightness of the diffuse color component. Diffuse Level is available only for the Anisotropic, Multi-Layer, and Oren-Nayar-Blinn shaders. This controls how quickly the diffuse component blends into the ambient component. Roughness is available only for the Multi-Layer and Oren-Nayar-Blinn shaders. ExpertRating 3DS Max Certification - Get Certified Now! !